Biologists, researchers and policy specialists at the Conservancy of Southwest Florida, which has a mission to protect the region’s land, water, wildlife and future, have emerged as the authoritative expert for media covering the dangerous outbreak of red tide and algae blooms plaguing Florida waterways. The Conservancy’s team has gone on camera and on the record with journalists to explain the science behind red tide in the Gulf of Mexico and green algae filling canals, rivers and streams. Millions of dead fish, sea turtles, dolphins and manatees have washed up on area beaches, creating an environmental crisis that has brought National Geographic, NBC Nightly News, CNN and The Weather Channel to town. The algae’s toxic fumes can cause burning and itching sensations among those in close proximity to the water, and combined with the smell of dead fish, it’s negatively impacting tourism and restaurants along area beaches. Priority Marketing has assisted the Conservancy in its media outreach by scheduling interviews, managing media contacts and promoting the nonprofit’s breadth of expertise and advocacy. As a result, Conservancy staff have regularly been quoted in the Naples Daily News and The News-Press, as well as their sister publications within Gannett Co., including USA Today. Among local television affiliates, the Conservancy has been a fixture on WINK, NBC2, ABC7 and FOX4 as the crisis worsens. In times of intense media coverage, it’s important to accommodate requests for interviews and background information. Being front and center has helped the Conservancy maintain its position as Southwest Florida’s foremost environmental expert, but most importantly, provide accurate information that media can distribute to readers and viewers. For more information about red tide, please visit Conservancy.org/red-tide. To read about the Conservancy’s advocacy for water quality standards, visit Conservancy.org/ripple-effect. 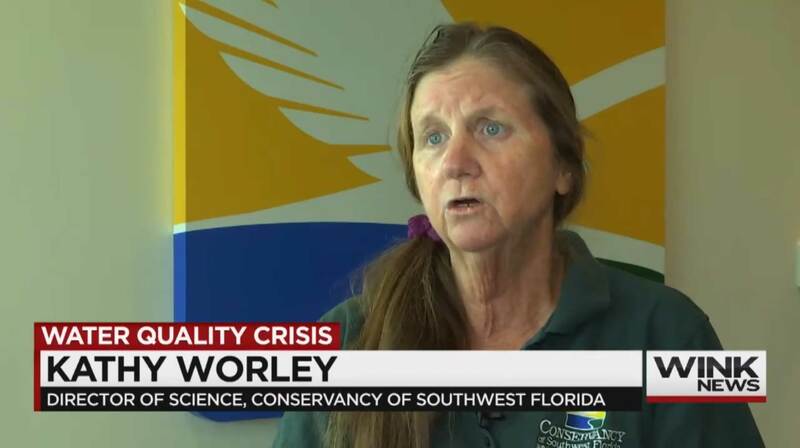 To schedule a media interview with a Conservancy biologist, researcher or policy specialist, please contact Holly Boldrin, Priority Marketing’s public relations director, at 239-267-2638 or email Holly@PriorityMarketing.com.